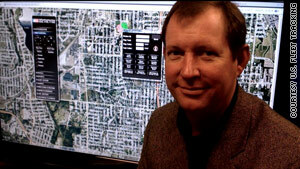 Jerry Hunter's US Fleet Tracking used a real-time GPS system to track vehicles for the Super Bowl. (CNN) -- As the players, coaches and halftime performers -- not to mention the Lombardi Trophy -- made their way to Miami's Sun Life Stadium for the Super Bowl on Sunday, Jerry Hunter and company were keeping a close eye on them. The Super Bowl contracted with Hunter's US Fleet Tracking to use its real-time GPS tracking system, which uses satellite technology that can "ping" a vehicle's location every few seconds. The Web-based mapping system was just one of the high-tech gadgets used Sunday to make sure the party for 74,000 people ran smoothly. "You think you and your wife have a struggle throwing a dinner party with 30 guests -- making sure everything is where it's supposed to be at the right time?" he said. "Imagine the Super Bowl." Sunday's Super Bowl in Miami, Florida, unfolded against a backdrop of new high-tech stadium features, smartphone applications and video technology. CBS Sports, which broadcast the game, is boasting about what it called a host of technological advances this year. The network used six high-speed, high-definition cameras -- they call the technology SuperVision -- with the ability to shoot 300-400 frames per second. (A normal camera shoots about 60). In a news release, the company said the technology was designed to show questionable calls like fumbles and receptions from multiple angles. The cameras were calibrated to measure first downs, be able to overlay virtual extensions of the goal posts to help see whether kicks were good, and launch an integrated animation package that CBS incorporated with its existing graphics. The technology was used Sunday night to give viewers lots of looks at an attempted two-point conversion by the New Orleans Saints. The play was originally ruled no-good by officials on the field. Shots of the play, however, appeared to show the Saints receiver had crossed the goal line and the officials eventually agreed, overturning the call. AT&T, the exclusive network for Apple's iPhone, beefed up its capacity to handle the phone calls, text messages and photographs that poured out of the stadium during the game -- a 31-17 win by the Saints. The company added three mobile cell towers and a new distributed antenna inside the stadium. The company, which has at times been criticized for getting overwhelmed when iPhone users gather en masse, similarly bolstered its network for last week's Pro Bowl game. "These are two of the biggest games of the year, and fans attending them want to be able to share the experience, as it's happening, with those back home, whether its through a voice call, text message, e-mail or picture and video messaging," said Rich Guidotti, AT&T Mobility's south Florida vice president, in a news release last week. "Our network team has been working for months to deliver the best possible wireless experience for the games and their related activities." Sprint, which said in a release that it spent more than $2 million on Super Bowl preparations, and other carriers also added towers to prepare for the information overflow. Smartphone users also were granted a spate of new apps to help follow the tilt between the New Orleans Saints and Indianapolis Colts. Blackberry users loaded up ScoreMobile, an app from Score Media Ventures that provided everything from previews and betting odds before the game to real-time box scores and blog posts during it. High-tech security scanners were used to scan both people and packages entering the stadium and law enforcement had bomb-removal robots at the ready (although federal authorities have said there were no specific, credible threats against the game). This year was the fourth Super Bowl for Hunter's Oklahoma City, Oklahoma-based company. The system uses a hardwired device about the size of a bar of soap that is installed either somewhere under a vehicle's dashboard or on the driver's person. Not only does the device provide tracking, but it can be used remotely to lock or unlock doors, honk the horn, open the trunk or enable and disable the starter. The operator can do those actions from a smartphone even when in another state, he said. "You can bring up the vehicle on an iPhone and start it from anywhere in the world or pop the trunk for the guy who wants to borrow your golf clubs from across town," said Hunter, formerly a tech guru at companies including EA Sports and Wal-Mart. While the devices, which cost about $400 each, work for organizing and security at events like the Super Bowl and Olympics, which US Fleet Tracking also will be working, they're most commonly used for things like ambulance dispatching and delivery companies needing to keep an eye on their workers. Hunter said one client found an employee using a company vehicle to back down a boat ramp at 2 p.m. on a Friday. Another discovered workers running their own private moving service with company trucks, he said. A city roads department found the crew in charge of patching potholes was instead going out into the woods and playing poker most days, he said. The devices used at the Super Bowl are able to update once every three seconds, he said. "This is not a historical playback," he said. "This is exactly where these vehicles are at this instant." In other personal technology news, social networking was expected to play a role in the Super Bowl, even for people who don't actually care about the game. According to survey results by business research site Knowteria, 41 percent of Super Bowl viewers will re-watch this year's commercials online and 48 percent said they're likely to discuss the ads on a social networking site.